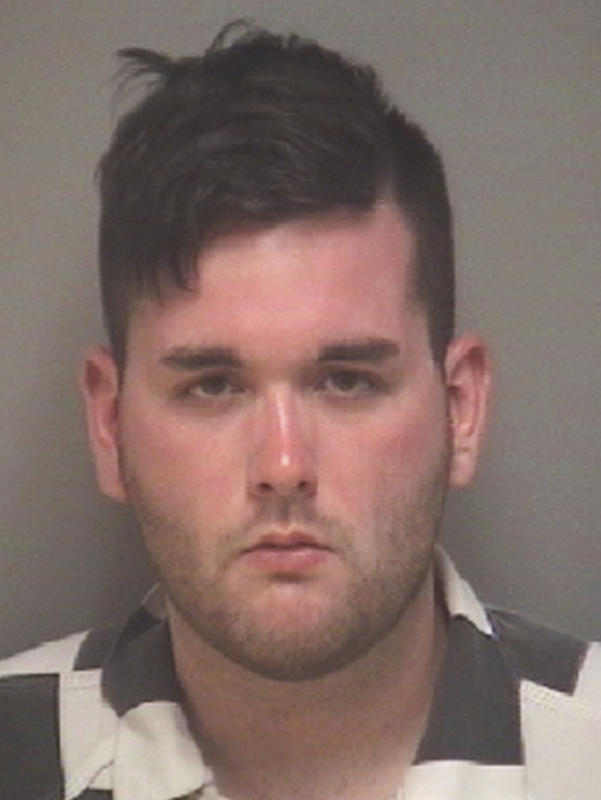 First-Degree Murder Charge Against Man Who Drove Into Charlottesville Demonstrators : The Two-Way James Fields Jr. of Ohio had been facing a second-degree murder charge until the judge upgraded it at a preliminary hearing Thursday. One protester was killed and dozens were injured. This photo provided by Charlottesville, Va., authorities shows James Fields Jr., who on Thursday had the most serious charge against him upgraded to first-degree murder in the death of a woman at a Unite the Right rally. The incident was part of a deadly weekend in Charlottesville that began as a purported protest against the removal of the Robert E. Lee statue and spun into a national controversy. On Friday night, white supremacists marched across the University of Virginia campus with torches and chants of "Jews will not replace us," and wound up brawling with counterprotesters. The next day, Unite the Right, a white nationalist demonstration, brought hundreds of demonstrators and counterprotesters to downtown Charlottesville. Among them was Heyer, 32, who friends say always spoke up against racism and anything that she felt was wrong. Fields, from Maumee, Ohio, was there too. "Investigators want to know whether Fields crossed state lines with the intent to commit violence," NPR's Carrie Johnson has reported. Some who knew Fields say he had a long fascination with Nazi Germany. He was "deeply into Adolf Hitler and white supremacy," a former high school teacher told member station WVXU. Prosecutors now will take the case against Fields to a grand jury and ask for an indictment.